If you have allergies, love animals too much or just looking to live a healthier lifestyle, then these muffins are perfect for yo u. These chocolate muffins are wheat-free, egg-free and gluten-free. They are absolutely delicious so enjoy! Set the oven to 180C and line your cupcake baking tray with cupcake or muffin liners depending on what size you would like your cupcakes. I like to use muffin liners as the bigger the better in my opinion. In a large, clean bowl add cocoa powder, brown rice flour, besan flour and bicarbonate of soda. Mix this well and in a separate bowl add the maple syrup, water, oil and apple juice and stir. Add the wet ingredients to your dry ingredients and fold the ingredients together, do not over mix, just enough to incorporate all of the ingredients together and until your batter turns into a smooth, lump free mixture. Pour the batter into the cupcake liners until they are 2/3 full, this will leave enough space in the oven for your cupcakes to rise. Leave the cupcakes in the oven for 20 to 25 minutes until the cupcakes spring back to the touch or you can insert a skewer into the center of your cupcake and remove it without any batter on it. Once your cupcakes are ready, remove them from the oven and leave to cool in their baking tin for 10 minutes. Once the 10 minutes are up, remove your cakes from the baking tin and leave to cool fully on a wire cooling rack. Once they have cooled fully, serve and enjoy! 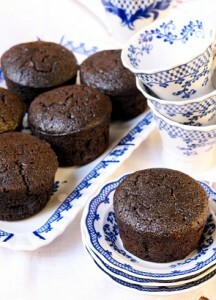 It is so simple and yet so good, hope you enjoy my vegan chocolate muffins.